BRUSSELS - NATO leaders on Wednesday called on all nations to maintain “decisive pressure” on North Korea, including by fully implementing United Nations sanctions, to persuade it to give up it nuclear, chemical and biological weapons. “We call upon (North Korea) to fully implement its international obligations; to eliminate its nuclear, chemical, and biological warfare capabilities and ballistic missiles, and abandon all related programs,” the statement said. “We call on all nations to maintain decisive pressure on (North Korea), including by fully implementing existing U.N. sanctions,” the statement said. North Korean leader Kim Jong Un pledged at an unprecedented June 12 summit in Singapore with U.S. President Donald Trump to move toward denuclearization of the Korean Peninsula, but has yet to provide details of how or when he might dismantle a weapons program Trump has vowed will not be allowed to threaten the United States. U.S. Secretary of State Mike Pompeo, who was in Brussels with Trump, held talks in North Korea last week aimed at agreeing a denuclearization road map. Sunday, he brushed off North Korean charges that he used “gangster-like” diplomacy in the negotiations and vowed that he would keep pursuing denuclearization talks with Pyongyang. Pompeo also said sanctions would remain in place until “a final fully verified denuclearization” that he said Kim had agreed to occurred. Trump suggested Monday that China, North Korea’s and main trading partner, might be seeking to derail U.S. efforts aimed at denuclearizing North Korea, but said he was confident that Kim Jong Un would uphold the pact the two agreed in Singapore. 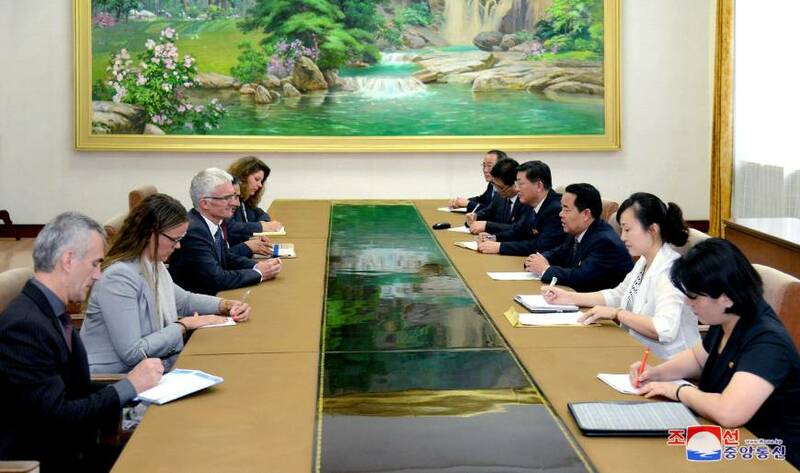 A senior U.N. official visiting North Korea meanwhile is highlighting malnutrition, drinking water and a shortage of medicines as problems facing the country. 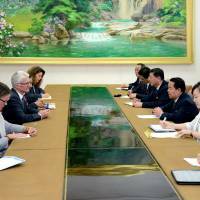 Undersecretary General for Humanitarian Affairs Mark Lowcock told a news conference in Pyongyang on Wednesday that much progress has been made in the last 20 years but “significant humanitarian challenges” remain. The U.N. released a transcript of his remarks. Lowcock said about 20 percent of children are stunted because of malnutrition, and about half the children in rural areas are drinking contaminated water. He said a shortage of drugs and medical supplies and equipment is making it very difficult to treat people. The U.N. is trying to raise $111 million for North Korea. Lowcock said only 10 percent has been raised so far, from Sweden, Switzerland and Canada.